Congress’ central observer Bhupen Borah on Tuesday said the Congress will do better in the northeastern States this Lok Sabha poll than the previous general elections. Speaking to reporters on the sidelines of a joining programme at the party headquarters here, AICC secretary Bhupen Borah, although could not ascertain how many seats the Congress would win out of the 25 seats in the region, but said there is no doubt that the results of the Congress this time shall be far better than the previous election. He was speaking to reporters on Tuesday after Tripura BJP vice-president Subal Bhowmik resigned and joined the Congress. Bhowmik is one of the prominent aspirants for the West Tripura Lok Sabha seat. 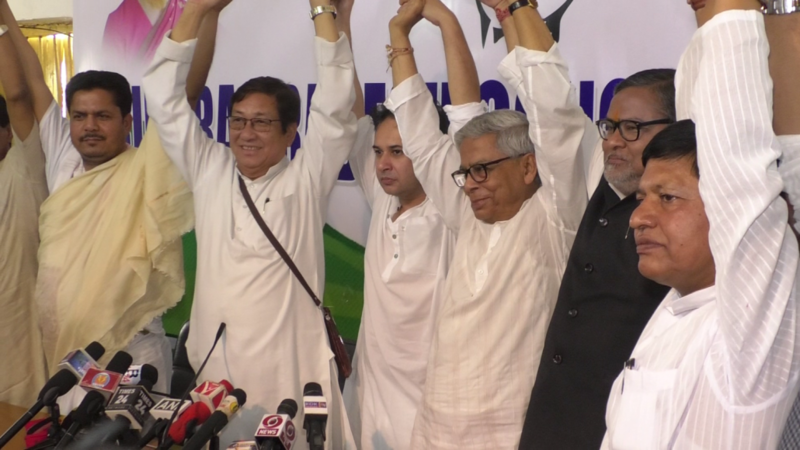 During the joining programme at the Congress Bhavan, Bhowmik, a former MLA along with one more senior BJP leader Prakash Das, a former minister and CPI-M councillor Debasish Sen joined the Congress. They took the Congress flag from the hand of Pradyot Kishore Debbarma, the newly-appointed Tripura Congress president, Congress central observer Bhupen Borah, former chief minister Samir Ranjan Barman, former Tripura Congress president and minister Birajit Sinha and other senior leaders. He declared that he quit the BJP and joined the Congress which is just ‘ghar wapsi’. On Bhowmik’s joining the Congress with two other leaders, the BJP immediately did not react but sources close to the party said that an emergency meeting has been called in the party headquarters here to discuss the matter. However, it can be said that only a day before Congress president Rahul Gandhi’s visit to Tripura for launching campaign for the general election, three senior leaders returning to the Congress shall surely give wind to the Congress sail.